UK Diving Services Ltd have secured a diving survey of Lobnitz Dock on the tidal Clyde in Glasgow, Scotland. Our underwater surveyors are to provide detailed information on the dock walls and adjacent seabed. The wall inspection will include a 2D sonar sweep to identify targets showing areas of concern and better understand bed levels along the walls. Visibility is very limited within the Clyde tidal waterway and sonar is an excellent back up to any diving survey. All UK Diving Services surveys are backed with free complimentary 2D sonar imagery. 3D acoustic sonar is also available POA. 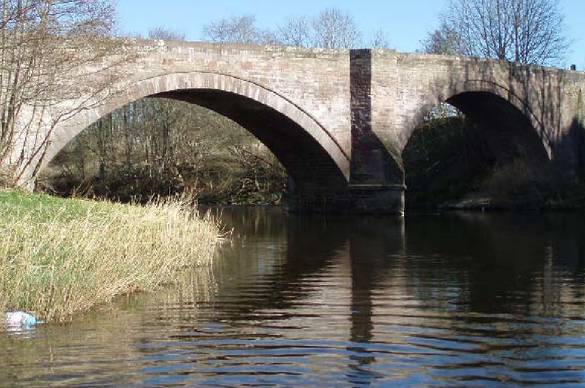 UK Diving Services Ltd are working with Kier WSP on behalf of Northamtonshire Highways providing diving services supported by hi resolution three dimensional sonar surveys on a nine arch masonry stone bridge. The 3D mapping data in .xyz format for point cloud will show undermining and scour holes within the structure and adjacent areas. The invert, piers and abutments are scanned by placing a transducer on a tripod as well as fixing to a vessel using gps. UKDS dive services recently provided underwater surveys of an extensive pier and jetty structure. The surveys included the inspection of culverts along the river and sea walls within the tidal estuary,. Working with strong tides and limited tidal windows UKDS diving service compiled a detailed underwater principle inspection (UPI) of the structure for comparison to the previous underwater general inspection (UGI) some years earlier. As one of the UK's leading underwater bridge inspection companies our surveyors provide detailed underwater inspection of bridges, culverts, dams, piers, docks, moorings and any other submerged structural asset. UKDS have recently undertaken a confined space entry beneath Hampton Court Palace in Surrey. The purpose of the survey was to determine the condition of the brick tudor structure and its lay. The structure was an old sewage outfall from and since demolished toilet block within the palace likely constructed around the reign of Henry 8th. Additionally a basic sonar scan was undertaken beneath the Jetty in front of the culvert to further peek into history. The overall condition of this 500 year old structure is a testament to the construction methods and materials used by the tudors. UK Diving Services have successfully provided dive surveys to numerous bridge structures across Kent, Sussex, Surrey and Scotland. The surveys were to assess the condition of recent remedial works undertaken at each structure. Written reports were provided including detailed digital photography and video. 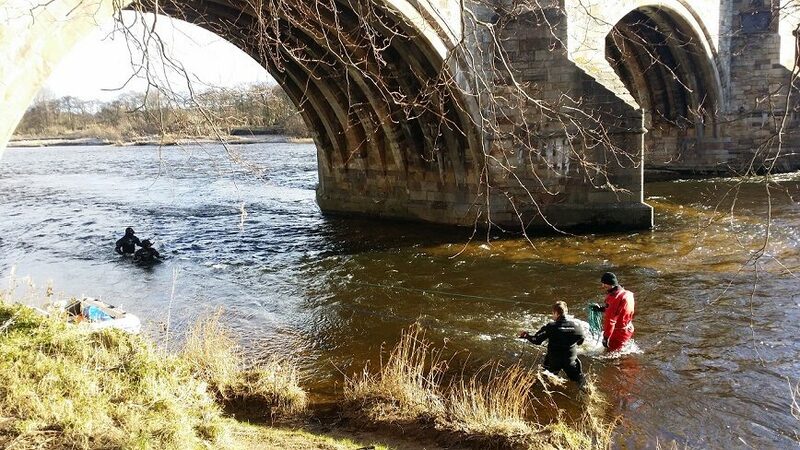 UK Diving Services Ltd recently undertook diving and sonar surveys on numerous underwater structures in Inverness in the Scottish Highlands, Scotland. The purpose of the inspection was to determine the extent of any scour if present. Due to the visual limitations in water using conventional video and still photography all our diving surveys are backed by underwater sonar giving stand off images for engineers to better understand the condition of their structures and to help implement remedial works. Sonar is now a complimentary service with all UK Diving Services underwater surveys. 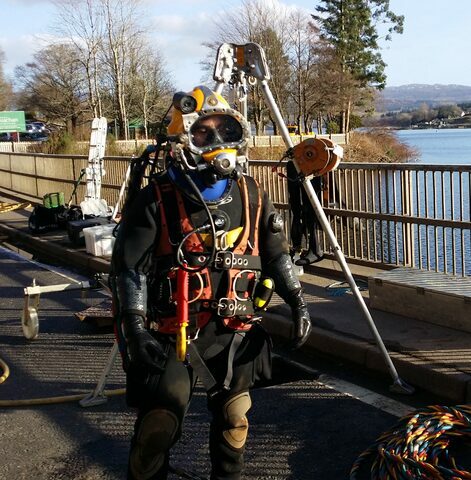 For the third consecutive year UK Diving Services have provided underwater services on various Bridge assets throughout Scotland on behalf of Transport Scotland. 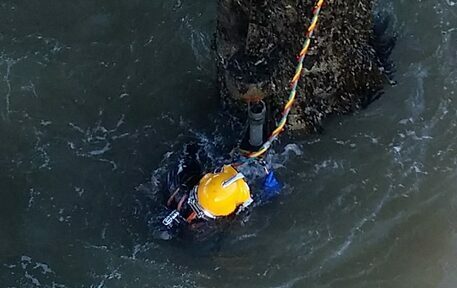 UKDS provided a full underwater scour and condition surveys of many of the bridge structures and concluded that urgent repairs were required to several of the structures. 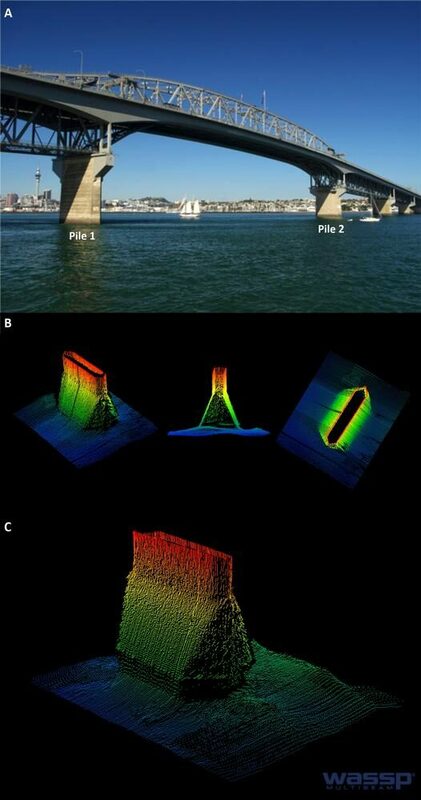 Some of the bridge structures exhibited deeper channel piers where sea bed levels had dropped and the supporting Hercules piles had become exposed. Repairs were undertaken including concrete grouting and the placing of extensive rock armour. Rock is a good fundamental scour protection however by protecting one pier generally tends to pass the scour problem to the next adjacent unprotected pier. We have now introduced sonar backed diving surveys for monitoring a structure's scour protection. 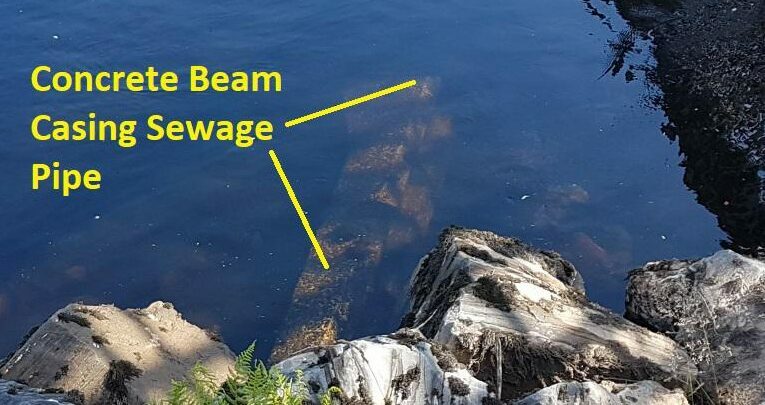 UK Diving Services recently assisted PGL Travel with an inspection of a blocked sewage outfall which discharges into the river Tay in central Scotland. Our diving team provided a digital video survey of the submerged elements of the sewage pipe including the open discharge end and trash screen. 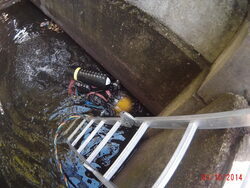 UK Diving Services Ltd have undertaken an internal inspection of of a decommissioned concrete sewage effluent pipe. the purpose of the survey was to understand the condition within the pipe to determine if the structure is structurally sound to support plant crossing the adjacent access road. The pipe was in a flooded state during inspection. UKDS are currently contracted by the Greenhatch Group to assist with surveying Southmere Lake in London. The project is part of a larger scheme which includes the demolition of a large residential estate with a view to build next generation housing. UK Diving Services recently completed a variety of principle bridge inspections on behalf of ATKINS engineering. The works included underwater inspection and sonar surveys of two large multiple arch bridges spanning the Ladybower reservoir. The structures were built during the second world war prior to damming and flooding of the valley and villages below. An interesting project that demanded extensive planning and skill due to the depth of the bridge piers which met bed level at 31m. UK Diving Services have been contracted on behalf of CAPITA to provide a river wall condition survey to determine suitability prior to the construction of a new road to link to the new River Wear crossing. The new road bridge will be a two span cable stayed bridge with an A-frame pylon rising to 105m crossing the River Wear between Castletown and and Pallion. The new bridge will have two lanes of traffic in each direction, plus cycleways and footpaths along its full length. Our dive team inspected a variety of structures along the wall from concrete piers and sheet pile walls to areas of timber fenders and rock embankments. 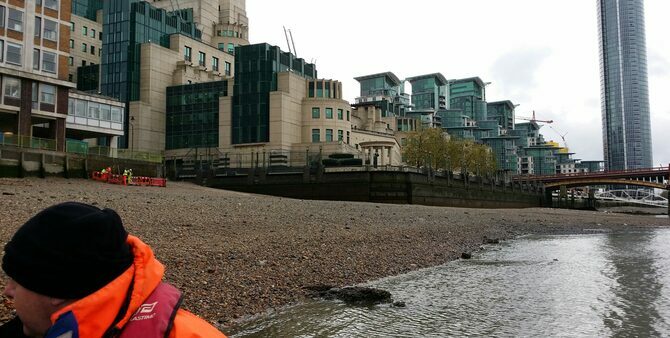 UKDS are providing safety boat services in central London on the river Thames. 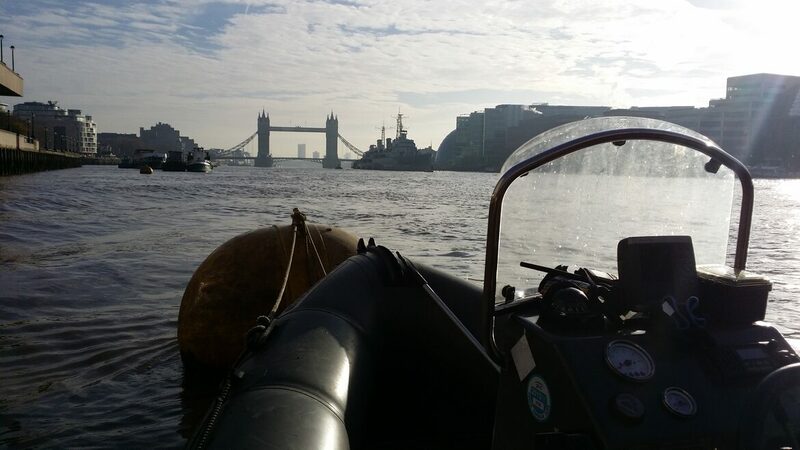 Our 7.2m RIB is equipped with all the latest safety equipment required by the Port Of London Authority to operate a rescue boat on the tidal Thames. 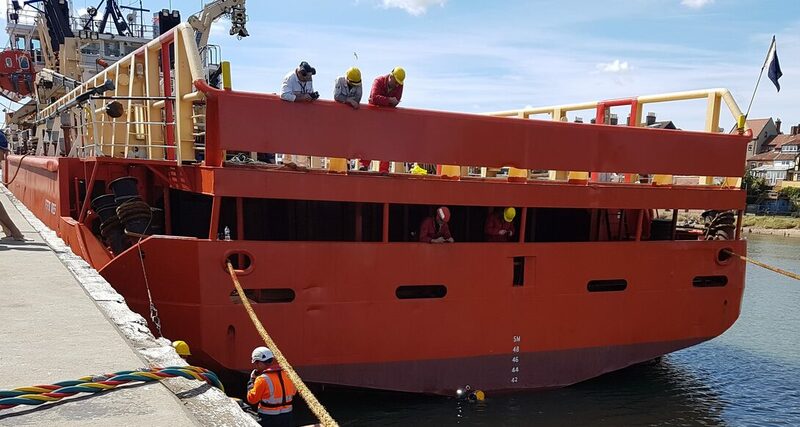 Last year UKDS operated a safety boat on behalf of Mackley at London Bridge whilst the new staircase was being fabricated and installed adjacent and over the waterway. During the 6 month operation our crews rescued 3 persons from the river Thames. UKDS have secured a river wall inspection in Sunderland north east England. The survey involves underwater inspection of the tidal river wall over several hundred meters. Due to likely poor visibility within the area divers will be using tactile probing methods of inspection backed by 2d sonar images. 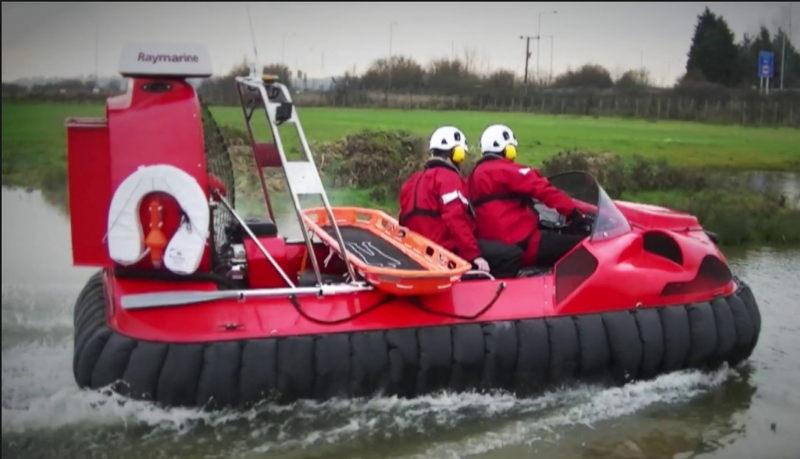 UKDS now offer hovercraft rental and hire services for cost effective, fast and safe transport for commercial operations nationwide. Applications include flood rescue, inter-tidal and near shore works, access, surveying, archaeology, sampling, mapping, environmental monitoring, crew transfer and mud rescue. 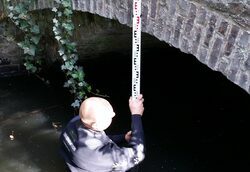 UK Diving Services have been awarded and undertaken 30 bridge inspections on behalf of SWECO and Glasgow County Council. The bridges include most of the roadway bridges on both the tidal and non tidal river Clyde. The inspections included underwater sonar and video recorded to BCI format. UK Diving Services are currently working on the Thames Tideway project on the tidal river Thames at Battersea and London Gateway. We are providing a 7.5m Port of London Authority coded RIB for safety and rescue boat operations on and within the waterway estuary. The Thames Tideway Tunnel is an under-construction 25 km (16 mi) tunnel running mostly under the tidal section of the River Thames through central London, which will provide capture, storage and conveyance of almost all the combined raw sewage and rainwater discharges that currently overflow into the river. As an add-on to our conventional underwater diving inspections UK Diving Services Ltd now provide Hi-resolution 2D & 3D multi-beam sonar surveys to survey river beds, stone piers, concrete bag work, sheet pile walls, docks, moorings, scour holes and abutments etc. For further details please email us. Since 2015 Titanium UK are providing safety boat operations at London Bridge as part of the new London Bridge staircase project adjacent the tidal Thames. 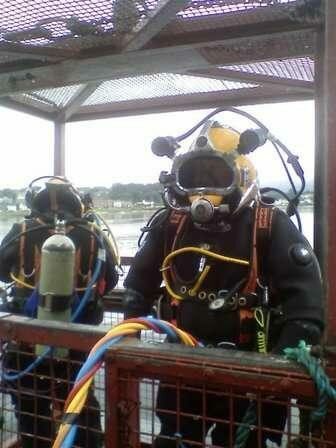 UK Diving Services win a confined space access contract with AECOM. Services include providing access to flooded culvets where diffrential pressure and other site specific hazards are present. The inspection will include cctv, UT readings and ndt. This RIB has awesome sea keeping capabilities along with a substantial power delivery from its DF200HP Suzuki engine. 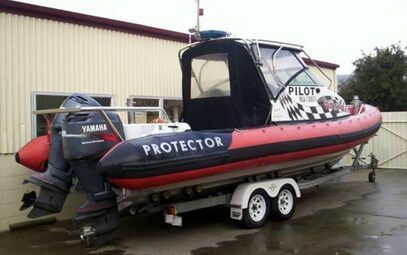 This is a go anywhere RIB thats now available for RIB charter and hire in the UK. Call us today to hire this RIB with commercial skipper and crew. Click here to see the XS RIB in action as used by the police. UK Diving Services Ltd have taken delivery of a new aluminium lifting barge to assist with our day to day diving and marine operations. The vessel comes complete with spud legs for extra stability for lifting heavier loads onto the large storage deck. The vessel is road transportable so can mobilise to any UK location at short notice. Lifting capabilities are up to 5 ton. Call our team for further information if you wish to hire or charter this pontoon lifting barge. 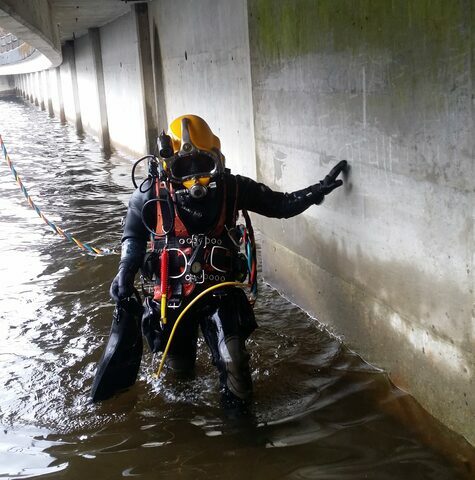 UK Diving Services Ltd recently undertook an inspection of a bridge with flooded box beams.The inspection involved surveying inside the chambers of the flooded box beams including the voids and diaphragms between them. CCTV footage was taken during the inspection. 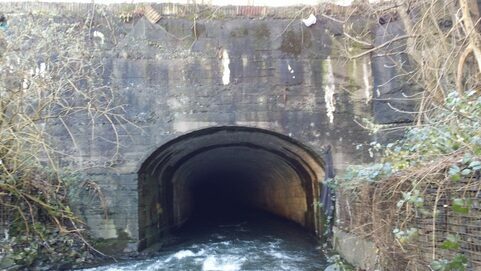 UK Diving Services Ltd recently undertook a visual/condition survey of the 126m partially flooded Six Bells culvert in Abertillery, Wales. In addition to the visual inspection our confined space engineers took laser measurements to determine the line of the culvert/tunnel. 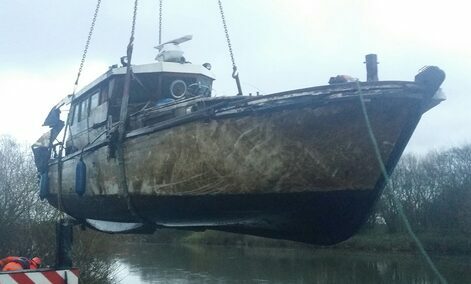 UK Diving Services Ltd provided the diving expertise to assist Commercial Boat Services with recovering a sunken Camper & Nicholson motor cruiser on the river Trent in Nottingham. Our 5 man HSE dive team attached 6no x 5ton IBU's to the the vessel whilst she was laying on the river bed at Holme lock. Once the motor cruiser was re-floated the team from CBS towed her to a local crane site where she was lifted to shore in one piece. UK Diving Services Ltd provided diving and vessel support during a tide gauge replacement at Cromer for the National Oceanography Centre (NOC). UK Diving Services Ltd provided safety boat services whilst operatives took core samples and screw pulls along Albert Embankment as part of the Thames Tideway Tunnel project. As part of any works on the tidal Thames where operatives are working on the foreshore the PLA (Port Of London Authority) require a safety boat to be in position in the event the tide were rise and cut off any person from safe egress. Other considerations are swells up to 1.2 m from passing vessels. Our team were security checked by the MET Police. UK Diving Services recently provided a licensed rescue boat with qualified crew for safety boat operations whilst operatives were working over fast flowing water. Workmen assembled scaffold over a rail bridge spanning the river Lune at Arkholme in the Lake District. Rainfall and flow levels were monitored continuously to allow work to progress safely. 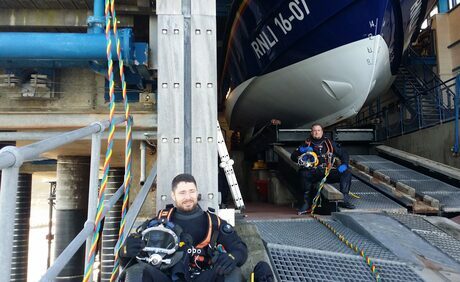 UK Diving Services Ltd deployed a commercial dive team to inspect the underside of HMS Gleaner whilst she was moored at Harwich. The ships commander was experiencing vibration at increased rpm. Our diver found and removed nylon netting from the starboard propeller and prop shaft solving the technical issue. 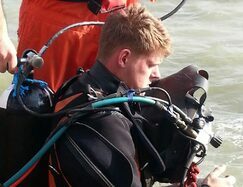 contracted UK Diving Services to provide detailed underwater inspection services on behalf of their client. Our services included providing soundings as well as scour and structural assessments. On the 22nd July 2013 UK Diving Services Ltd were contacted to assist with locating a missing pilot presumed lost at sea when his Cirrus aircraft crashed into the English Channel less than 24 hrs earlier. Rescue efforts were called off by the Coastguard and RNLI after wreckage was found off the Dungeness coast. UK Diving Services Ltd liaised with the RNLI who provided us with the times and co-ordinates of the area where the floating wreckage was last found. Because the exact impact zone was unknown and the depths of water were beyond practical air diving limits it was necessary to locate the aircraft using sonar and ROV's. The search pattern information we obtained was passed to the sonar and ROV team who used the information to help locate the aircraft. 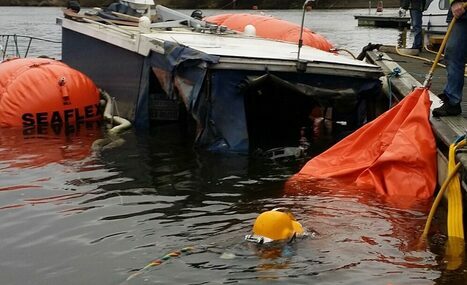 The underwater rescue team found the wreckage. UK Diving Services Ltd were contracted in to provide rescue and safety boat services for operatives working in shallow water underneath a rail bridge in Yorkshire. In addition our company provided floating platforms and work boats to assist with the essential bridge maintenance. 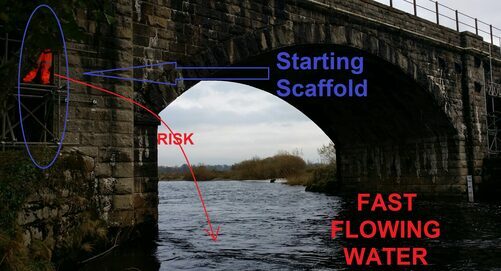 The scaffold was erected and dismantled one arch at a time so not to overload the weak bridge. 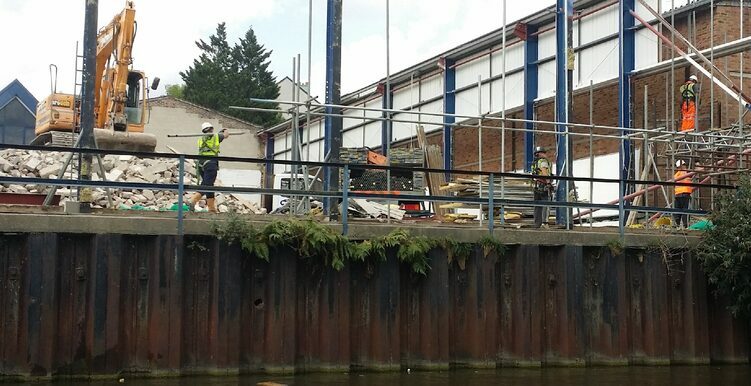 UK Diving Services Ltd were recently contracted in by Prodem Ltd for a striking of a scaffold next to the Limehouse Cut in east London. Our safety boat team provided rescue and safety boat services at the east London location whilst operatives worked near the waters edge. Our dive team removed 4 hydro-graphic sensors from beneath the vessel at the stern of the ship and replaced them with higher specification models. 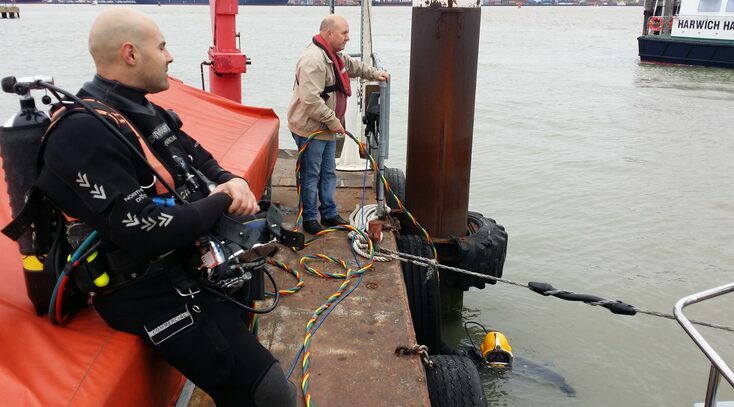 UK Diving Services were contacted by EGS Surveys to find and recover a lost magnetometer off of the Harwich coast. The magnetometer was lost whilst EGS were surveying an area to map sunken vessels. 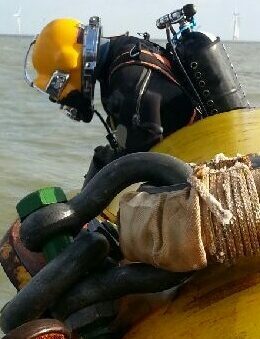 Our commercial dive team deployed from the port of Harwich and anticipated diving both the high and low tidal windows to allow optimum chance of success. 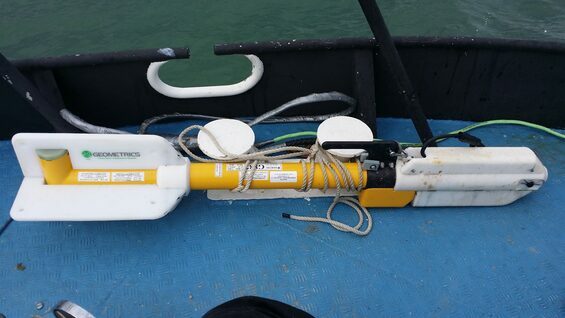 The magnetometer was found and recovered on the first dive at high tide...a good result for all parties! UK Diving Services Ltd recently undertook an interesting tank dive for Seaflex Ltd where an inflatable mattress was inflated and placed on the surface of the water inside the tank whilst operatives broke open an opening in the roof of the sprinkler tank. The purpose of the operation was to install new hatches to allow for easier access in the future. The purpose of the inflatable matress was to catch falling debris so there was no risk of any material entering the sprinkler system and causing any blockages. Our divers entered through narrow access channels in the side of the tank. 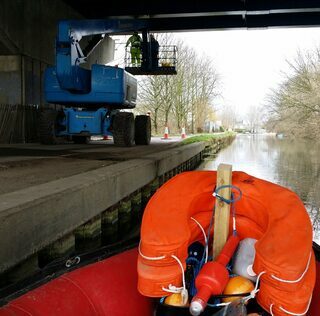 UK Diving Services Ltd are providing on going safety and rescue boat hire services for Skanska Balfour Beatty JV whilst operatives are assembling scaffold to the underside of the M25 carriageway crossing the river Lee. Our company with its extensive background in underwater and marine services is providing water safety and boat traffic marshaling throughout the duration of the project. UK Diving Services Ltd are providing safety boats and rescue boat hire services for operatives painting a bridge spanning the river Lune. Our commercial safety boats and crew are well placed to provide safety cover on this demanding inshore waterway. Our vessels go through rigorous testing and our crews highly are trained. UK Diving Services Ltd were instructed to survey a large fire water storage tank near Liverpool which had a faulty pump. Our professional divers found the sprinkler tank had small amounts of debris inside and concluded they were sucked into the pumps impeller causing pump failure...as proven upon isolation and removal. Our teams have extensive experience in accessing a variety of water and chemical tanks. UK Diving Services Ltd have recently been engaged on river bed survey operations by providing licensed survey boats for surveyors to access waterways as part of Network Rail scheduled rail bridge inspections. Our survey boats also second as safety vessels.